Having read I Am Pilgrim by Terry Hayes about a year ago, I have mixed feelings about this book because there are lots of similarities. 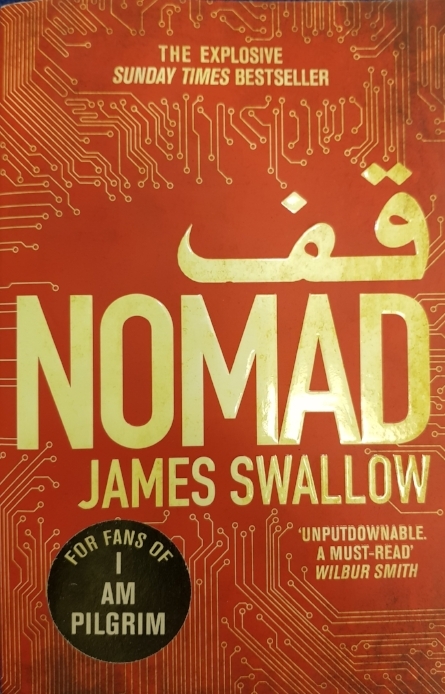 Nomad, written by James Swallow and published last year, opens with a lively and absorbing first chapter leaving you curious to what happens next. Based initially in Barcelona, we then jump to a secret service mission on the north coast of France, and then to a camp in the Middle East to introduce all the relevant characters. Marc Dane, the main character, is involved in an incident that leaves him looking very guilty, but it is up to him to prove his innocence. In true blockbuster style this means breaking lots of rules and further implicating himself in order to show that it is someone else on the inside that's misbehaving. MI5, MI6, private companies, American military and terrorism: all very current affairs, and there are a few moments in the book that you can relate to things that are going on in the world right now. My favourite parts are the action scenes and character development. There is a slight twist at the end, but I must admit that I was half expecting it. A slight love story put me off a bit and without giving away any spoilers, it's got a movie deal written all over it. Keeping this review brief, I enjoyed this book. It is a perfect beach holiday read for both men and women. My husband read it and thought it was as good as I Am Pilgrim and leaves more to your imagination than its similar fellow novel. The characters lack some depth and it doesn't really require much brain power to get through, but is enjoyable all the same. I still have not thought of a witty and unique reviewing rating system, so I would give this a 3/5 and advise my friends to borrow my copy if they wanted to read it, not buy their own.